I was trying to capture traces of jeep’s tires. 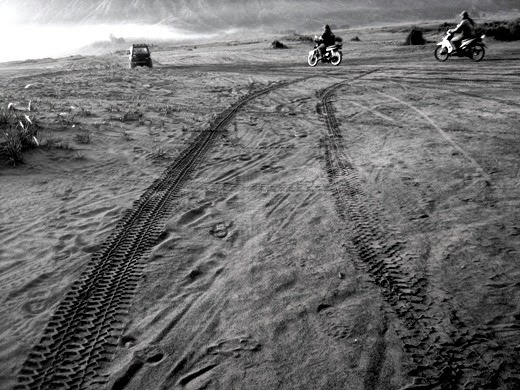 The vehicle traces captured on sandy Ngadisari caldera at Bromo National Park (East Java, Indonesia). 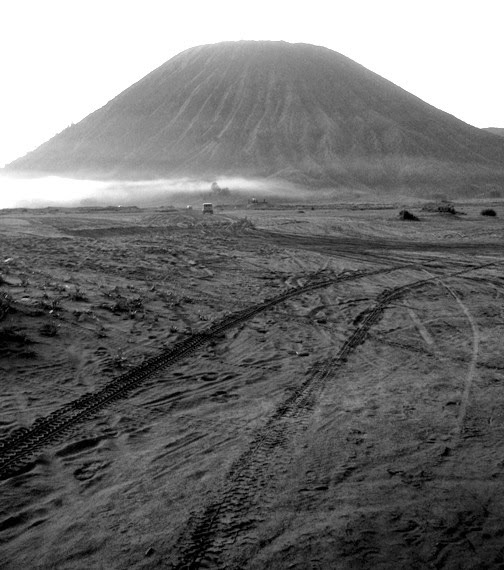 After watching sunrise from Kingkong Hill, next destination is Tengger caldera and Bromo Crater. Rented jeep rides took us passing through wide sandy caldera. I felt like joining rally Paris-Dakar. It was a great experience. Fine photos. I particularly like the neat patterns in the sand. What a great trip that must have been. Beautiful photos, that's a great volcanic area. Those tire tracks are like a dramatic sign leading to the mountain. Great scenes. Exquisite photos, I love the framing and perspective, very poetic! Great shots and perfect for black and white. I like the perspective of these shots. Gorgeous images! Perfect in b&w.